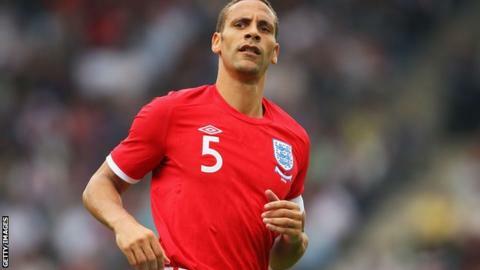 Rio Ferdinand has pledged his support to England ahead of Euro 2012 which gets under way on Friday. The 33-year-old's representative accused England boss Roy Hodgson of showing Ferdinand "a lack of respect" by leaving him out of the squad. "Just so we don't get it twisted here....I'll be in a pub somewhere supporting England this summer! Love the lads!" said Ferdinand on Twitter. This comes after John Barnes and David Pleat backed Hodgson in his decision. Pleat branded Ferdinand's representative Jamie Moralee "out of order" for his comments, while Barnes believes the manager should be backed. "Everyone's international career comes to an end, it's not a question of being disrespectful in leaving someone out," said Barnes. "I had 79 caps and I was left out because my time was over. You have to back the manager." Ferdinand, who has 81 caps for England, was left out of the original squad before being overlooked again when Gary Cahill was ruled out of the tournament through injury on Sunday. Liverpool defender Martin Kelly, 22, was preferred to the 33-year-old who last played for his country in June 2011. Pleat, who managed both Tottenham and Sheffield Wednesday, is also backing the new England boss. "I think the agent of Ferdinand is really out of order," Pleat told BBC Radio 5 live. "I think agents of other players could equally make a case from time to time. "Micah Richards evidently has had a very good season and he's been shunned, so to speak. "Nobody has a divine right to play in the side, I think some of the headlines are very dramatic. "Yes Ferdinand is 33, he's played around 30 games or so this season, and he has done well since January, but he's [Hodgson] got a natural attacker of the ball in John Terry. "I think it's for footballing reasons and Roy has got four players now who can cover at centre-back. I think a right footer and a left footer in Terry and Lescott is a decent combination." Former England international and Leeds United team-mate Danny Mills is also supporting Hodgson and believes there could be more to it all than meets the eye. Speaking to BBC Radio 5 live he said: "What bugs me though is that we have had Rio's advisors making quotes but until we have heard from Rio Ferdinand himself we don't know exactly the conversations between Rio and Roy Hodgson. "We don't know how or when he was told he was going to be left out of the squad. "We don't know the state Rio is in. Where he is, whether he has gone on holiday and if he has done any work at all so I think it's really difficult to talk about and I think this is the issue with representatives making statements on behalf of players these days. "If Rio has that big a problem then come out and speak yourself. He is an intelligent man and if he has got something to say I think Rio Ferdinand would come out and say it. "You also have to remember that one of Hodgson's coaches is Gary Neville, who knows Rio incredibly well, so I am pretty sure Roy would have asked his opinion. "To not invite Rio back into the squad, there must be deeper reasons for that."